We at Horizons are proud to have supported the Empowering People and Communities Taskforce. Here's an infographic illustrating the Taskforce's achievements: you can read more detail here. The Taskforce has achieved a great deal in its one year lifespan, engaging many people who had a contribution to make in a positive way. 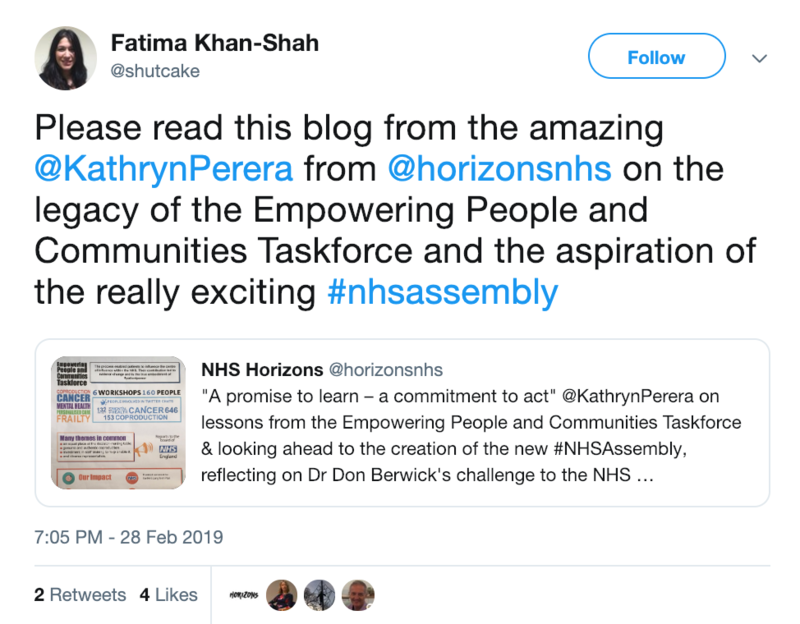 Horizons' director Kathryn Perera also wrote a blog describing the work of NHS Horizons in 2018 to facilitate the Taskforce. 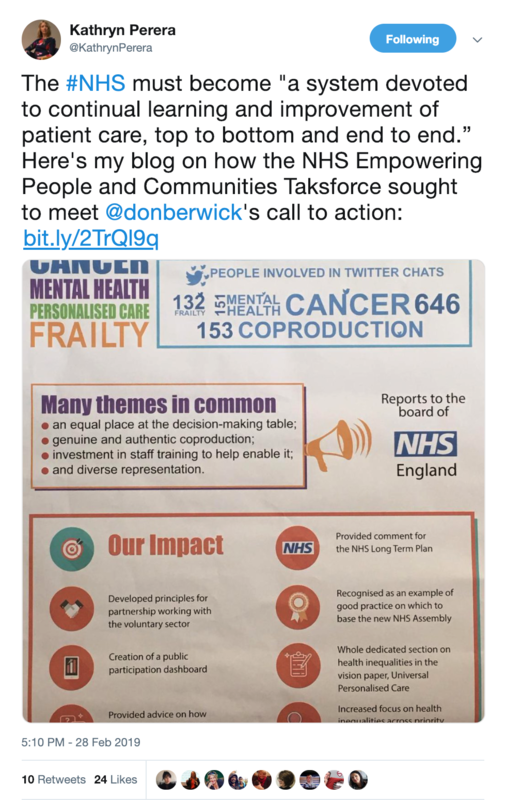 The Taskforce has laid the foundations for the upcoming NHS Assembly. 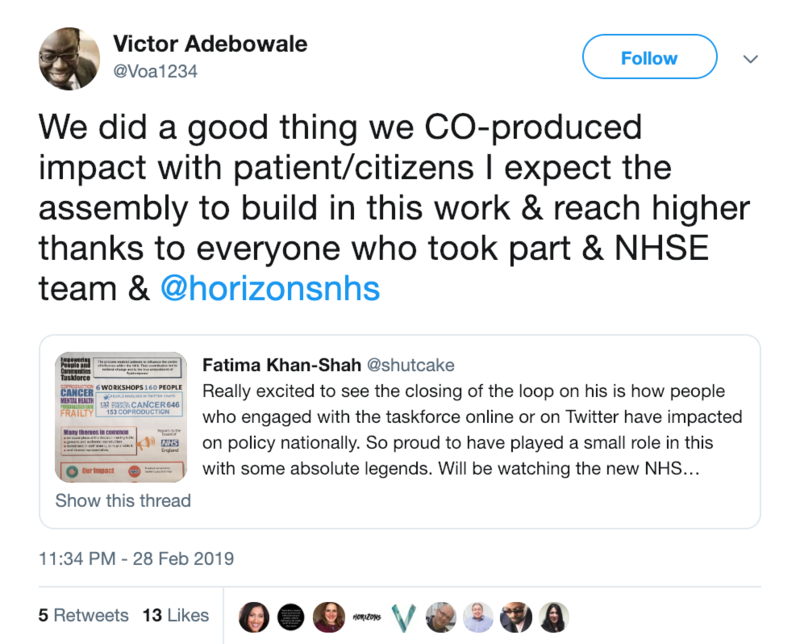 The Taskforce founder, Lord Victor Adebowale reflected on the work - participants have put in great effort and energy in co-producing impact with patients/citizens. 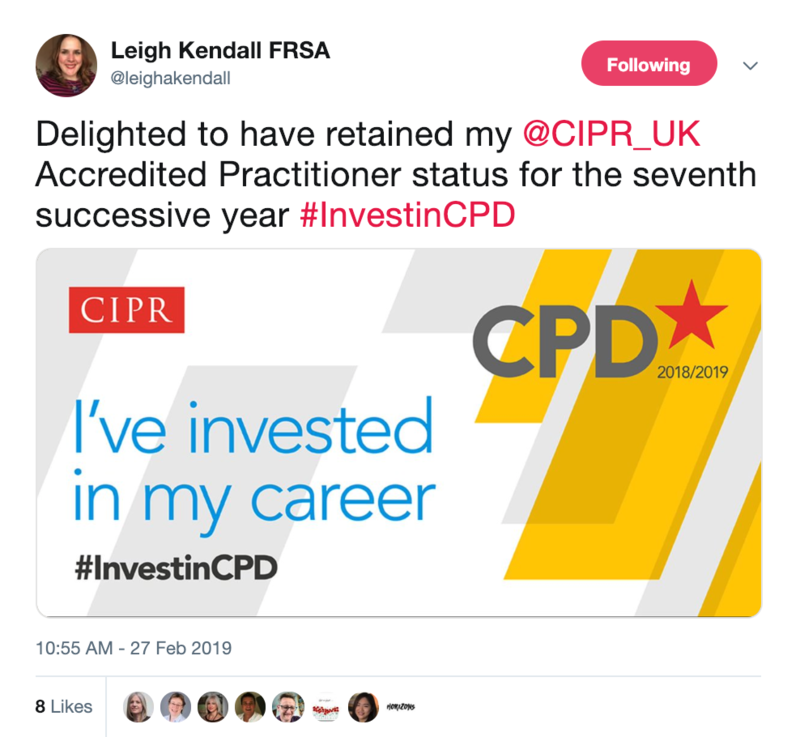 Horizons' Comms Lead Leigh retained her CIPR Accredited Practitioner status for the seventh successive year. Congratulations Leigh! Some lovely feedback for Kathryn. 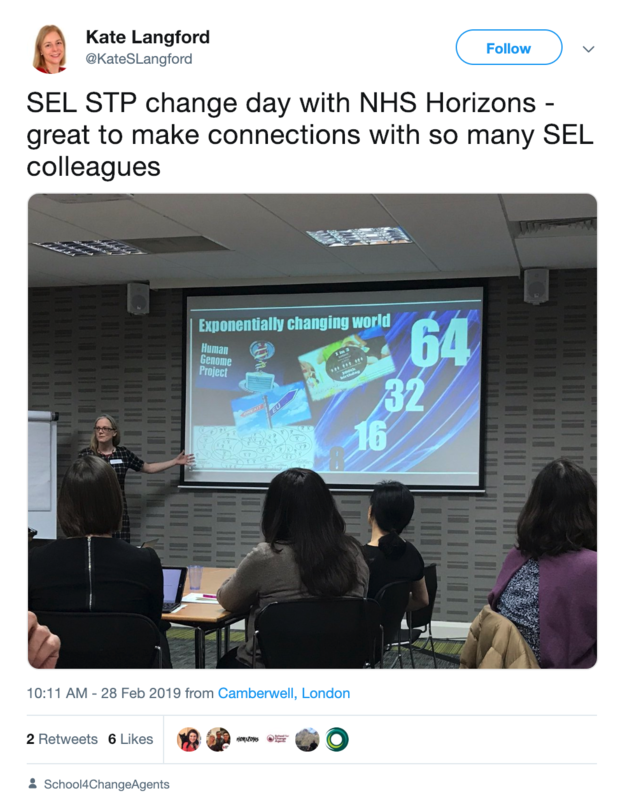 Our Head of Transformation Zoë and Project Officer Rosie had a change day in London with SEL colleagues. Want to know more about what they talked about? 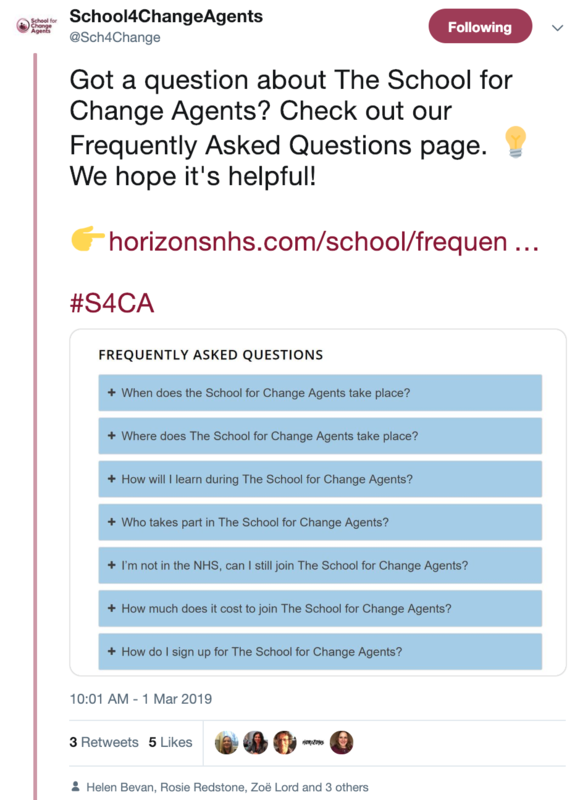 Sign up to our upcoming The School for Change Agents! 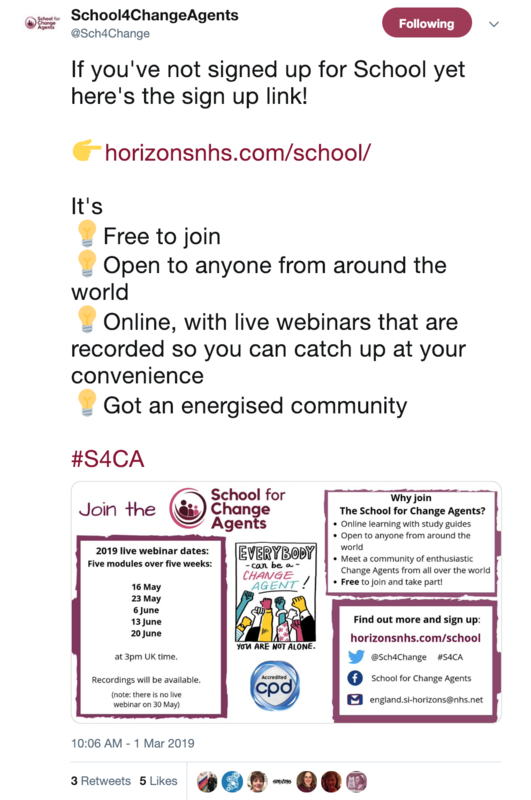 If you are someone who cares about your work but are finding yourself dancing in stifling hierarchies that slow us down in getting the changes you know are needed, find yourself criticised for being disruptive or negative or see what needs to change but don’t quite know how to change it, then the School for Change Agents is for you. 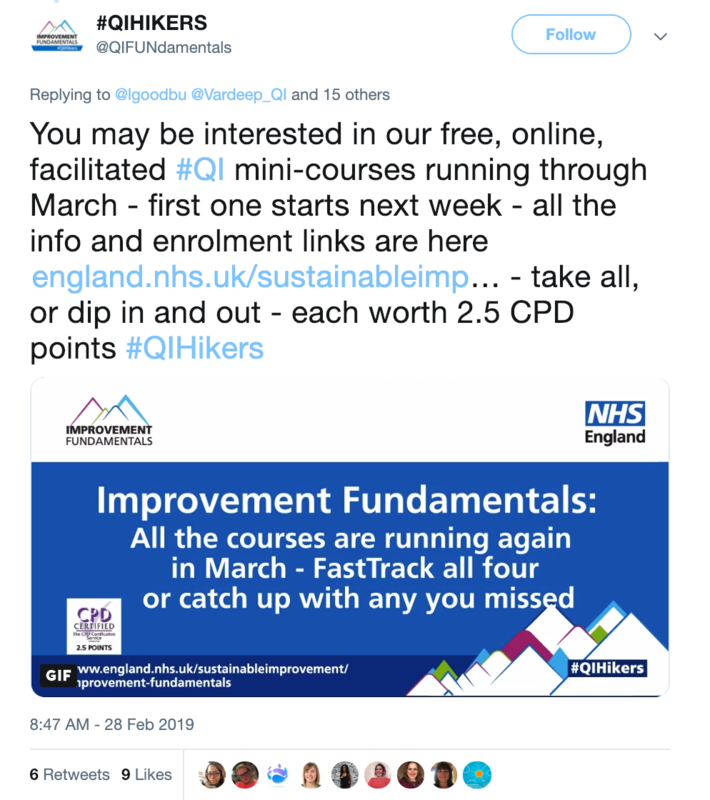 Are you interested in improving ambulance staff wellbeing? 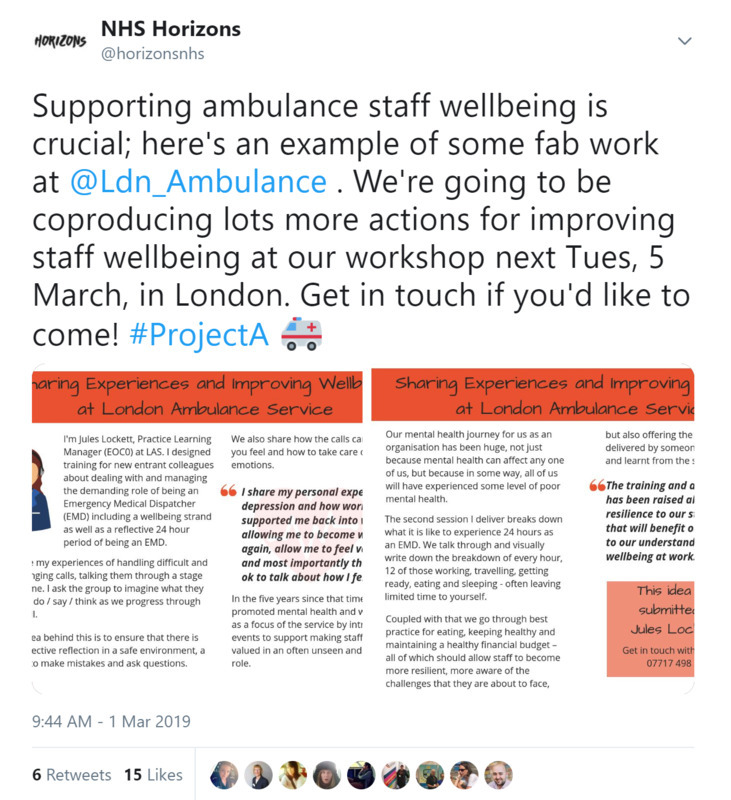 Join us in London on 5th March for a one-day #Project A event where we'll be co-producing solutions! 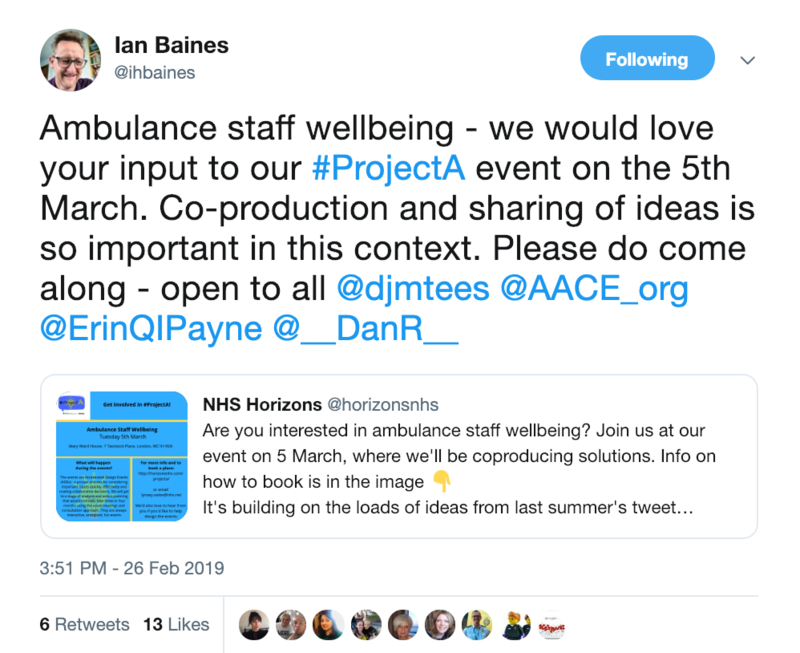 There's lots of great work already being done in the Ambulance Service to support staff wellbeing - join us on 5 March to help co-create more! 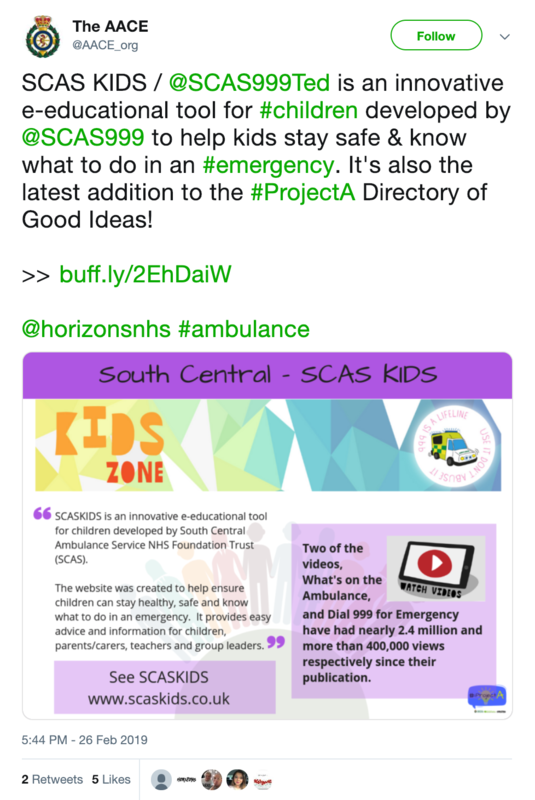 South Central Ambulance Service developed an innovative educational tool to help children stay safe and know what to do in an emergency. How great is that! 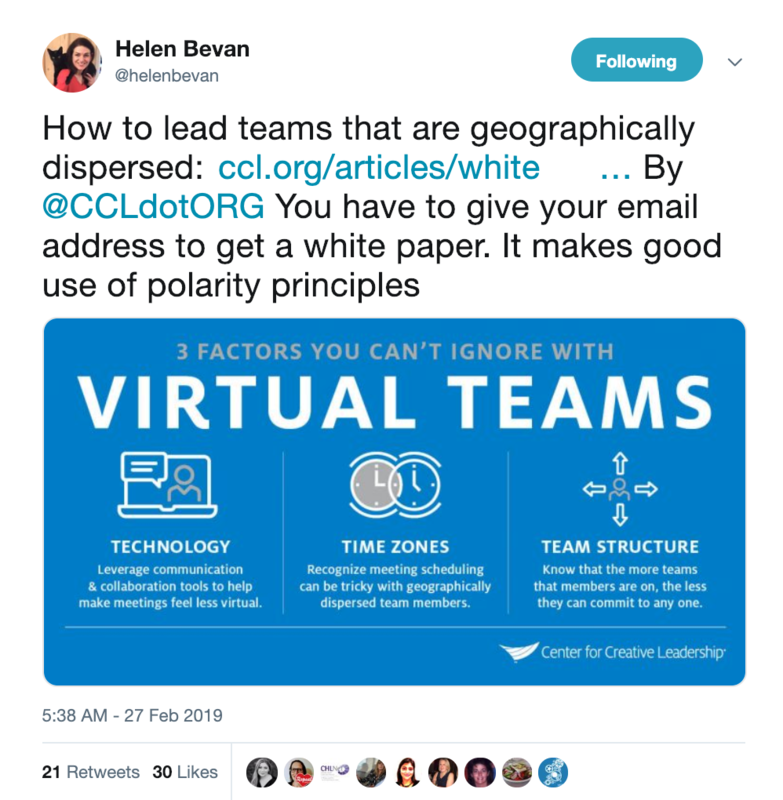 Of course it's been added to the #ProjectA Directory of Good Ideas! 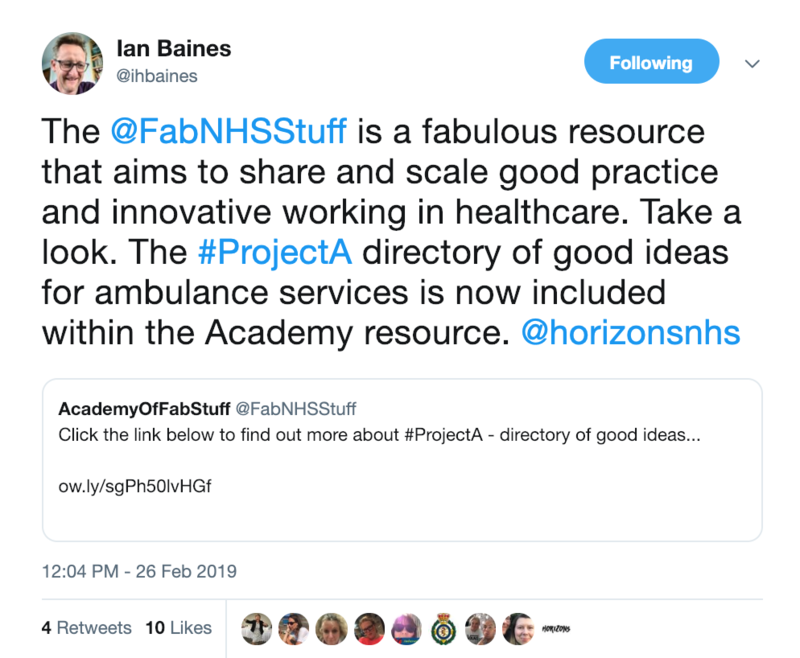 We're proud that some entries to the Directory of Good Ideas also feature in the Academy of Fab NHS Stuff. 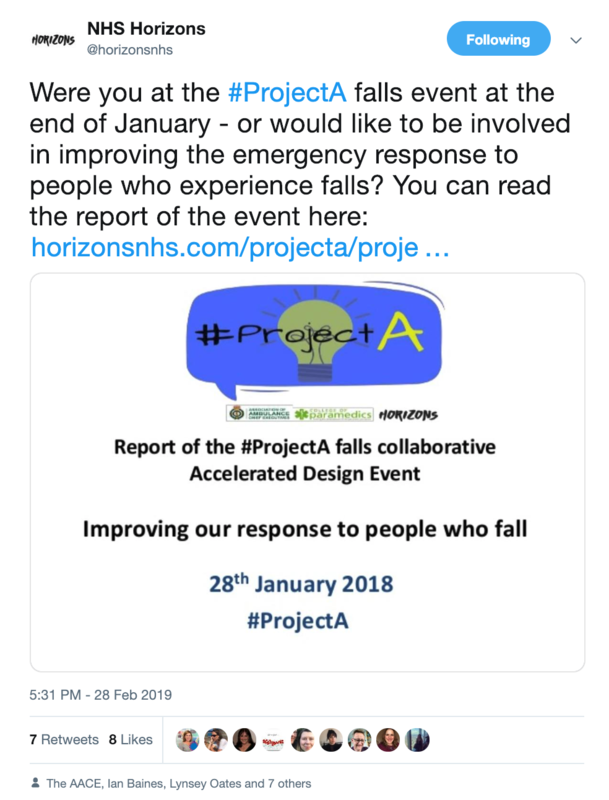 Were you at the #ProjectA falls event at the end of January - or would like to be involved in improving the emergency response to people who experience falls? Here's the report of the event if you'd like to know more! 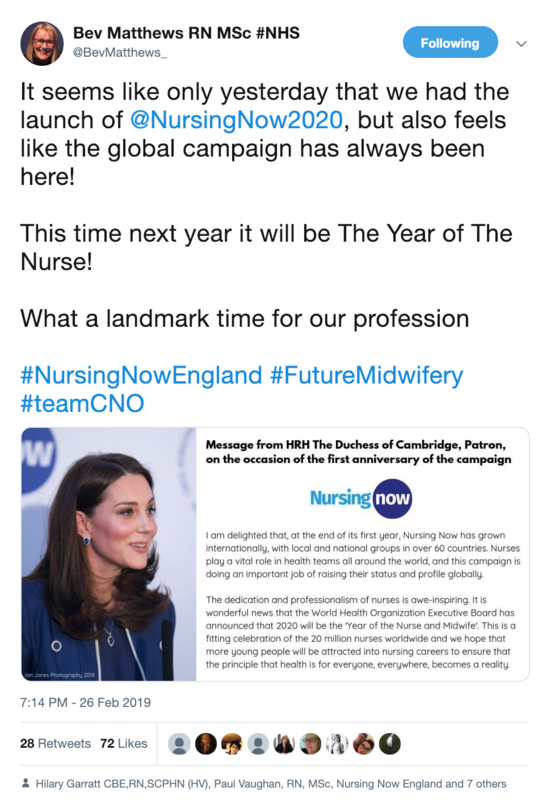 The global Nursing Now campaign has just celebrated its first anniverary. 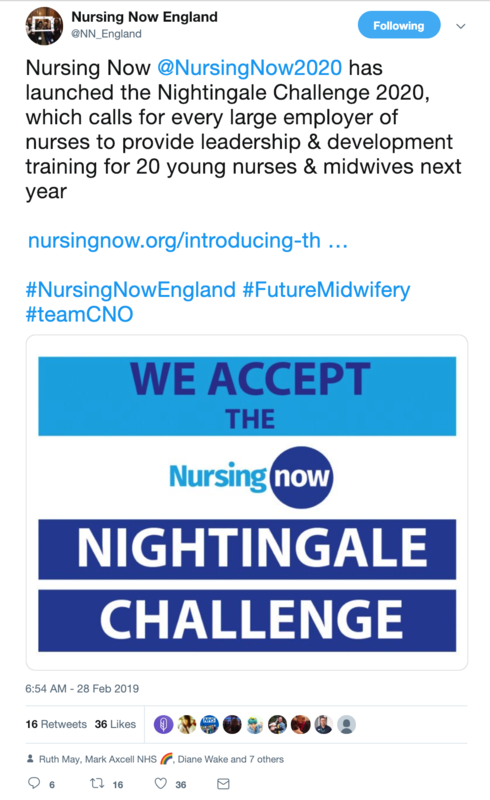 And in less than a year, we'll arrive in 2020, the Year of The Nurse and Midwife! Here's a great message from HRH The Duchess of Cambridge to mark the occasion. 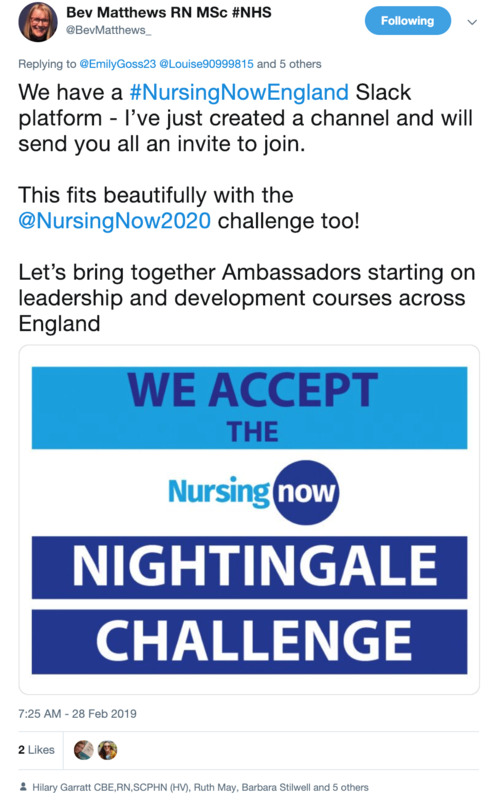 Nursing Now has launched the Nightingale Challenge 2020, which calls for every large employer of nurses to provide leadership and development training for 20 young nurses and midwives next year. This collection of nurses uniforms over the generations created by nursing students at Middlesex University. 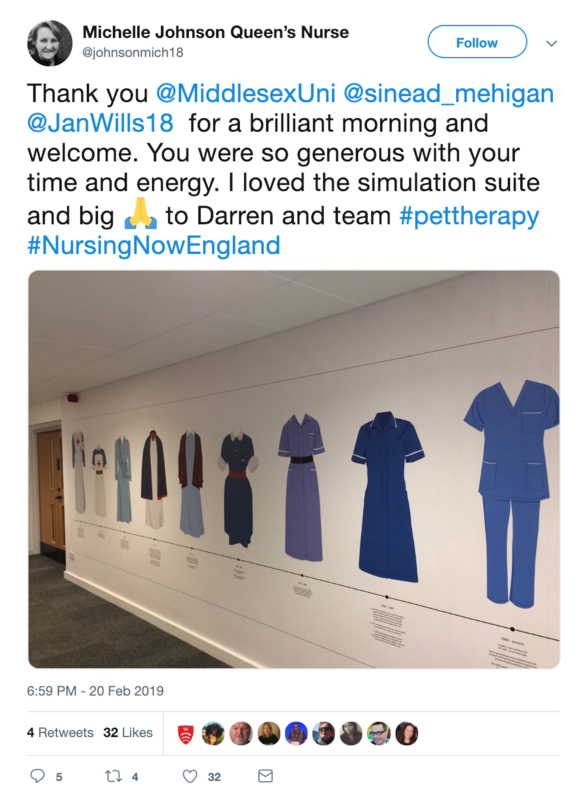 The last uniform shows how our perceptions of nursing is changing - not only what is most reasonable clothing for nurses but also it should be a uniform for all genders! Our mini gender neutral uniforms for nursing is a hit! The beautiful Ava is a liver transplantee. 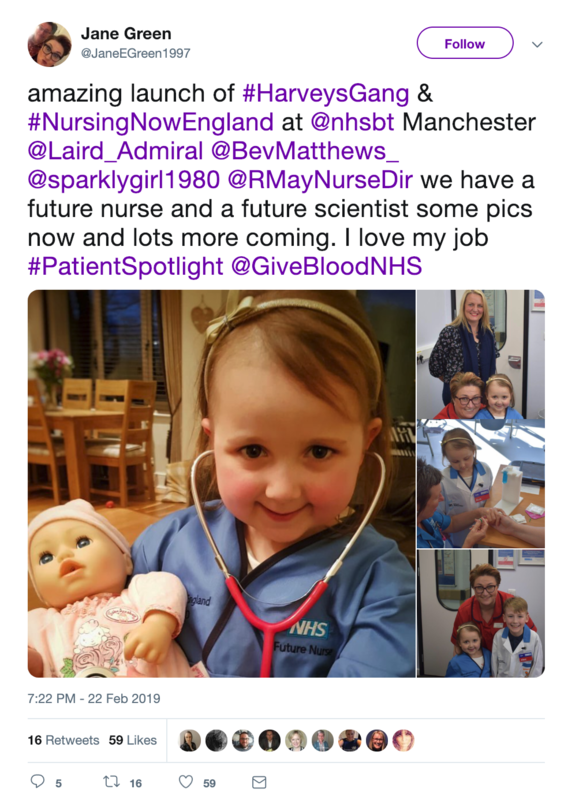 She and her brother Alex visited NHS Blood and Transplant and tried on the mini gender neutral uniforms for nursing. She loved it! 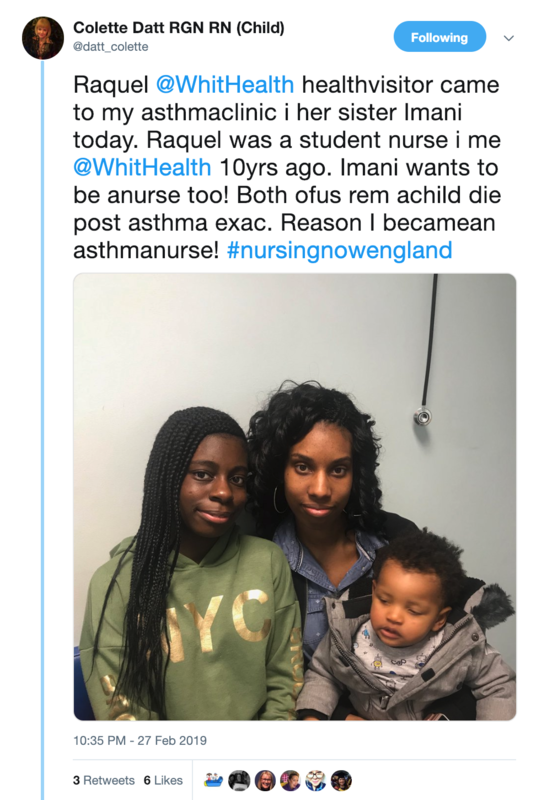 Another aspiring nurse in the making! 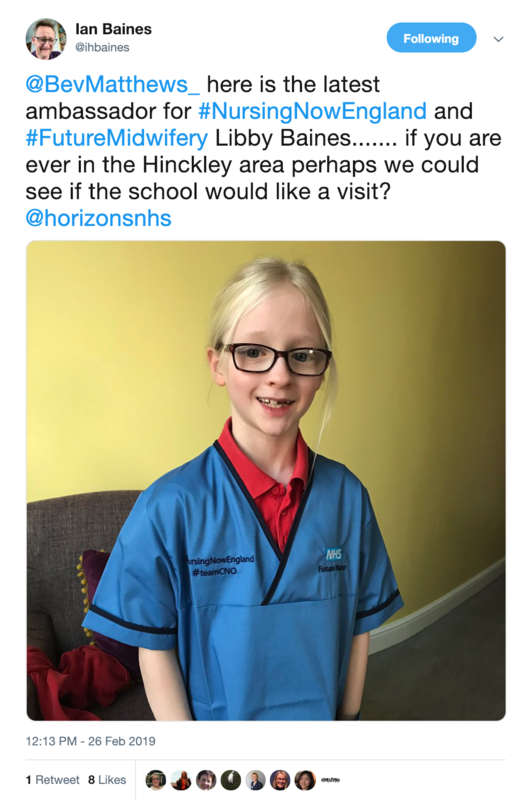 Here is another aspiring young nurse! How cute is Libby! 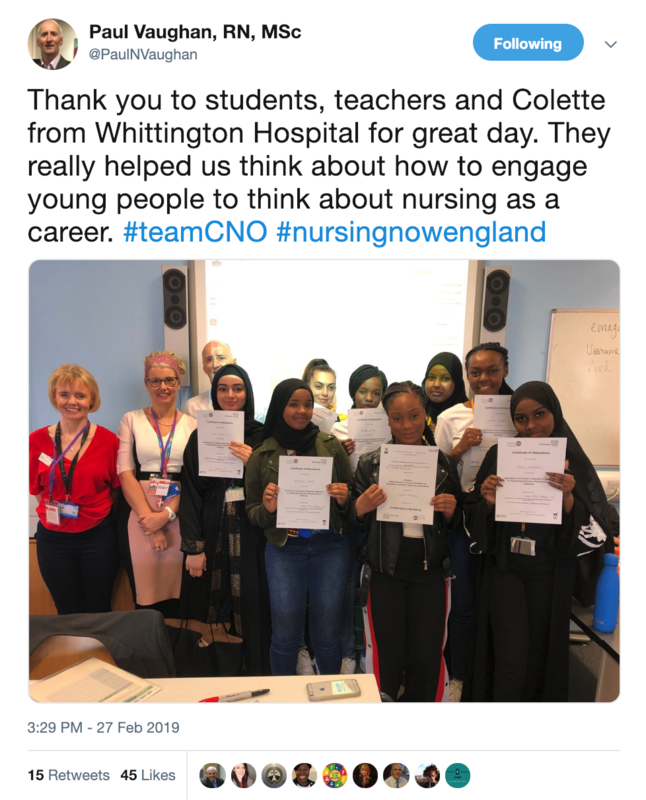 Paul Vaughan, Director of Nursing at NHS England continued the school visit challenge. 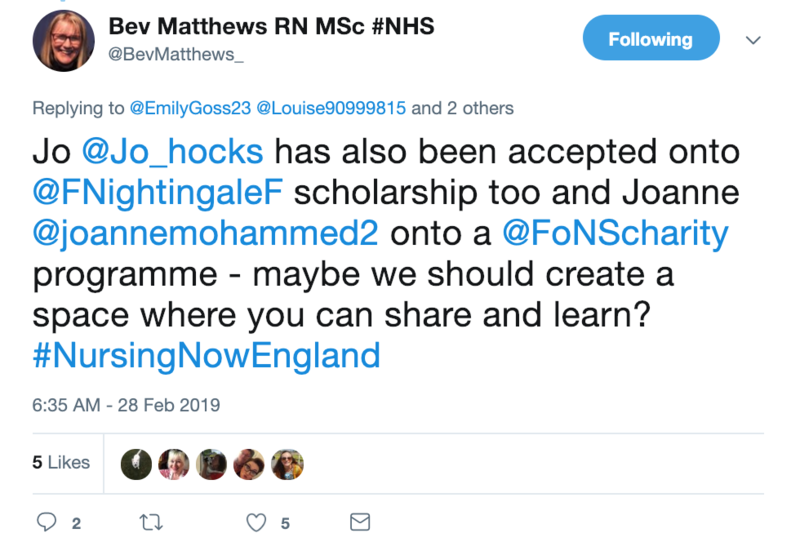 He worked with young people, teachers and careers advisers to think about how we position nursing as a first choice career. Ambassador Sue shared her journey: what a wonderful collage! 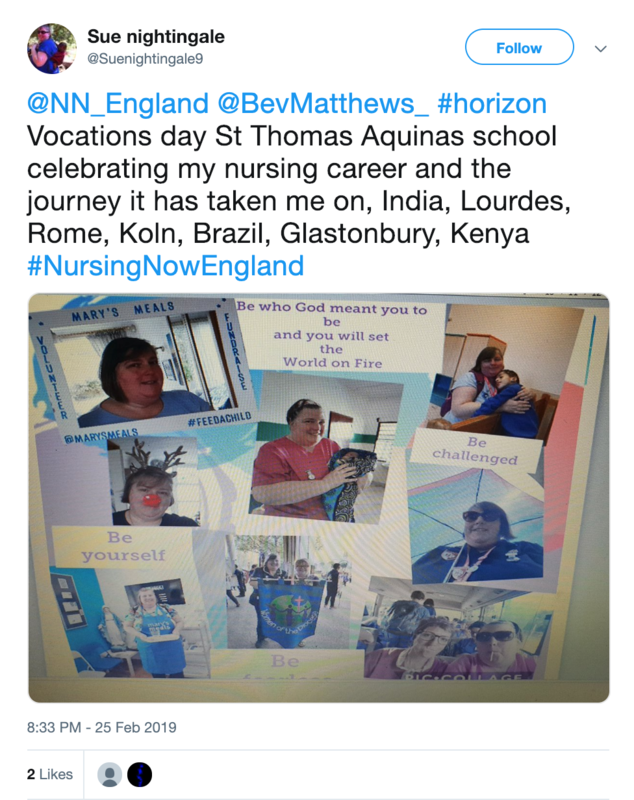 A career in nursing can take you all over the world! 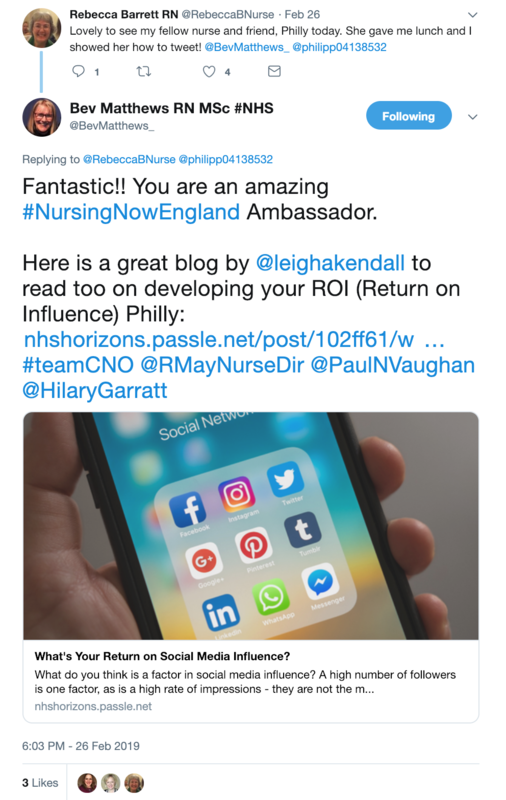 Ambassador Colette is making every contact count to recruit ambassadors and future generation of nurses! 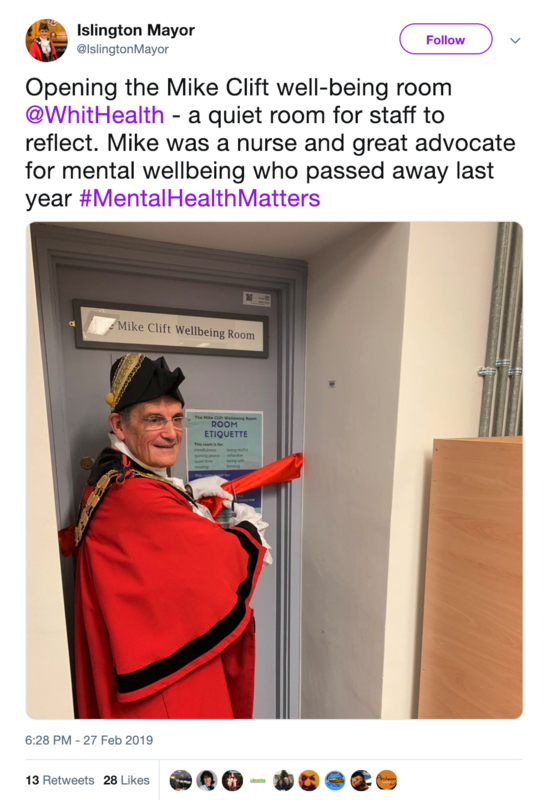 A well-being room opened in the name of a great nurse Mike Clift who advocated for mental wellbeing. 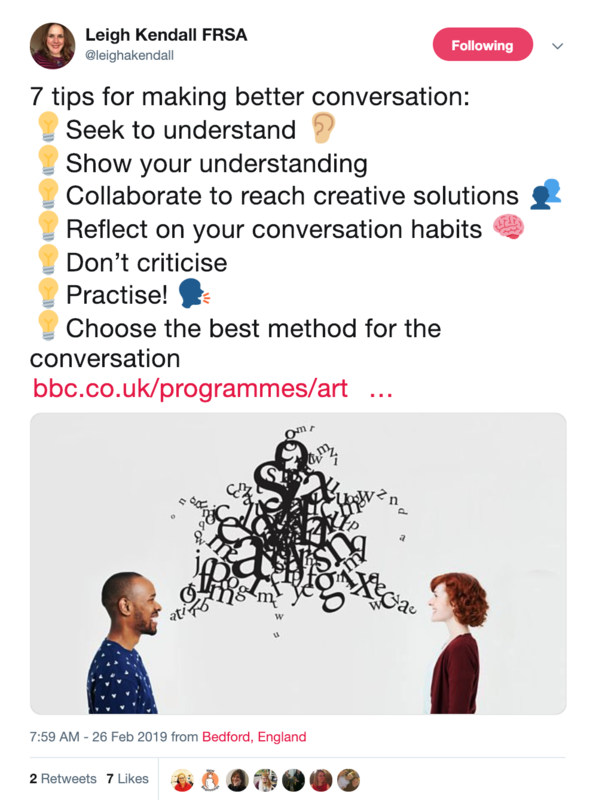 Looking after ourselves and connecting with our values is a key building block for positive perceptions. 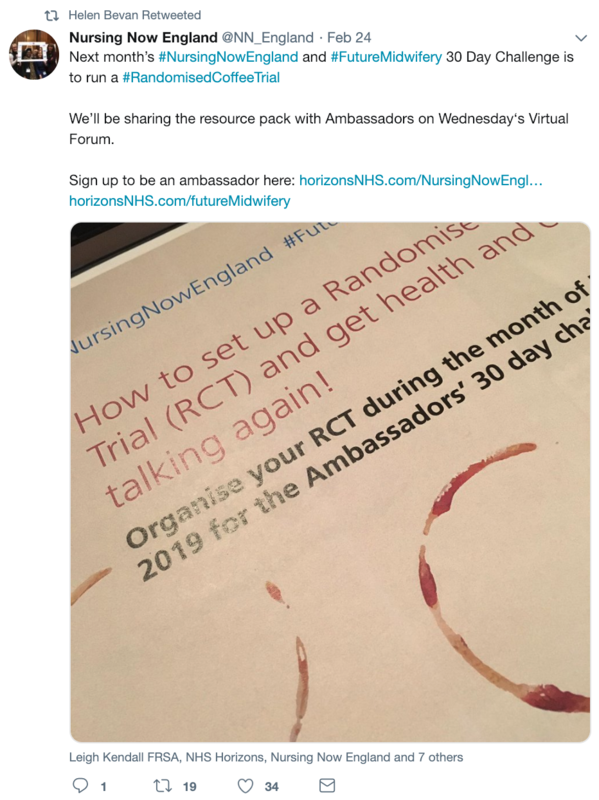 And they are using virtual approaches to connect our future nurse leaders! Our Ambassadors are developing their leadership skills and are successful on securing places on leadership courses. 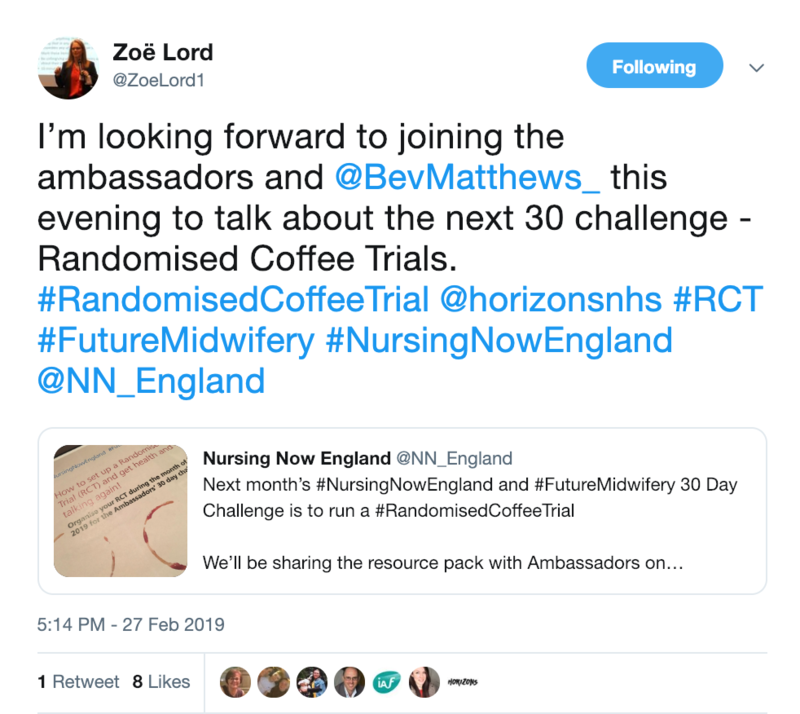 March’s #NursingNowEngland and Transforming Perceptions of Midwifery 30 Day Challenge is to run a #RandomisedCoffeeTrial. The Horizons' team and some ambassadors had a great virtual meeting for planning and preparation. 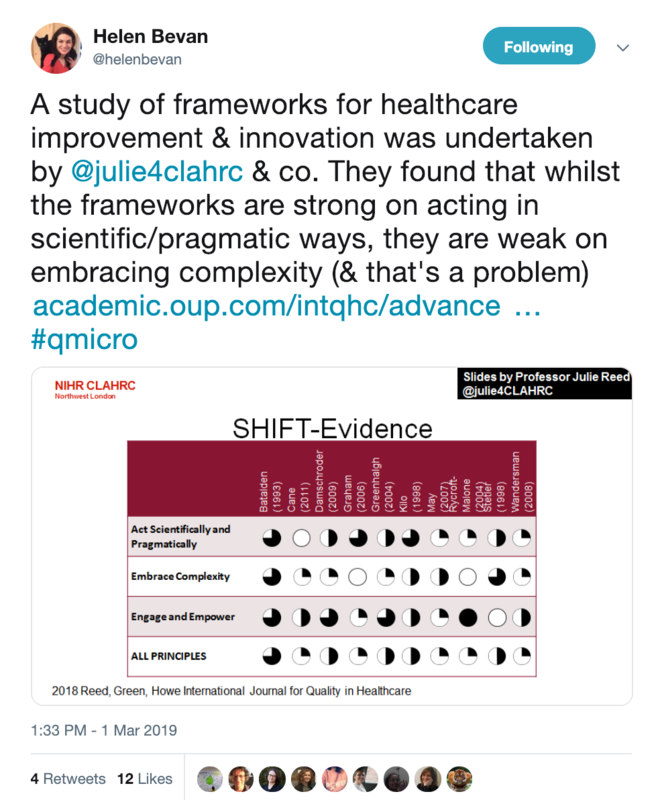 There is a resource pack to help guide you through setting up RCTs. Sign up to be an ambassador today to get a copy! 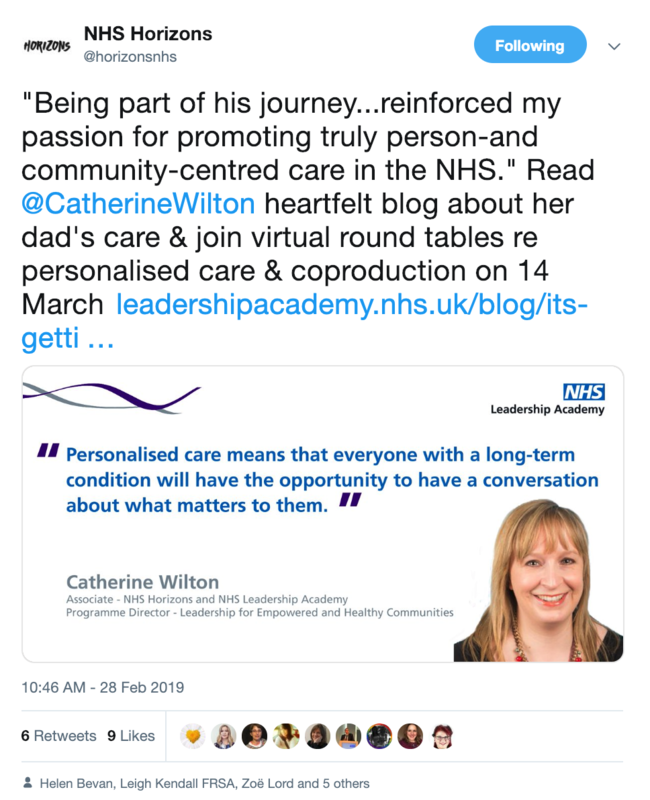 Read this heartfelt blog by Catherine about dad's care, join virtual round tables re personalised care & coproduction on 14 March. 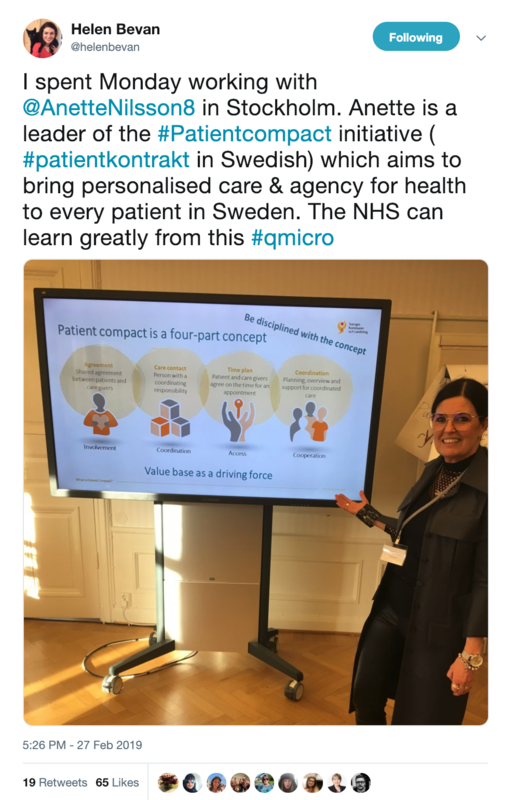 The Patient Compact initiative in Sweden aims to bring personalised care and agency for health to every patient in Sweden. 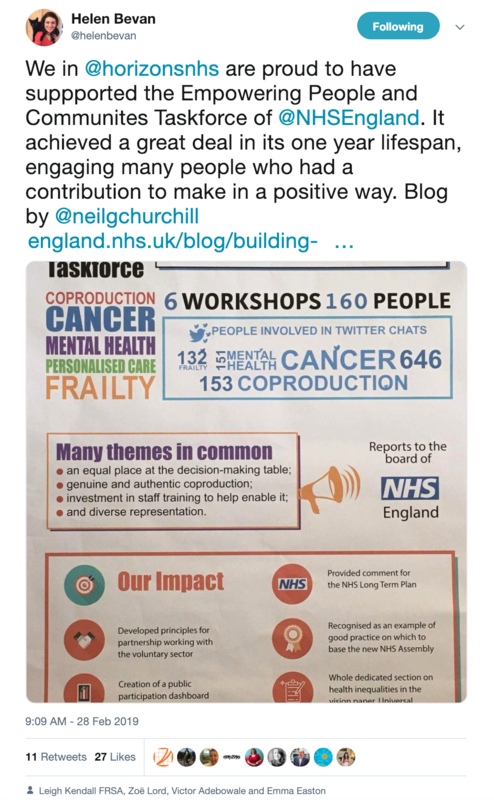 The NHS can learn greatly from this. 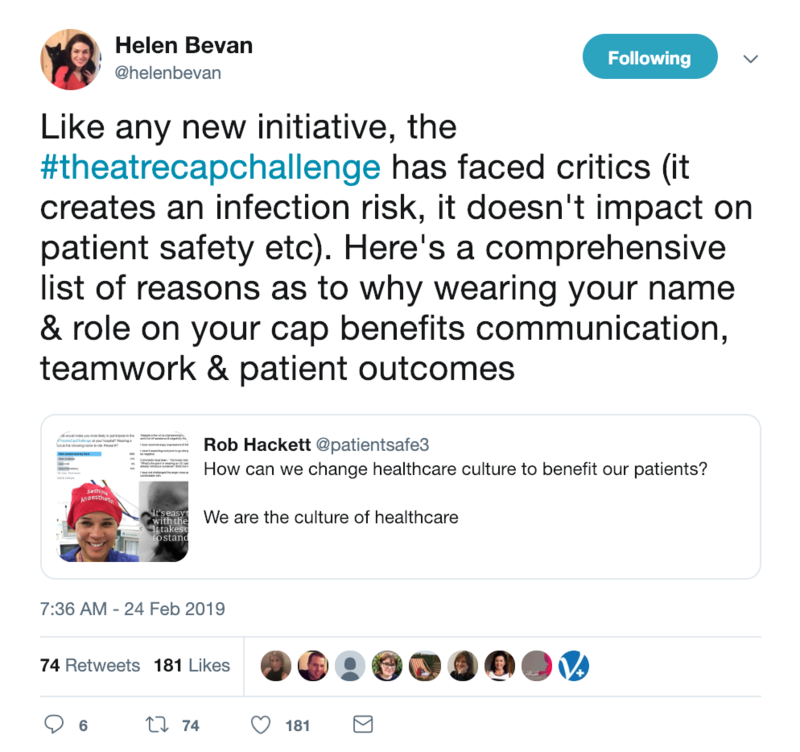 Like any new initiative, the #theatrecapchallenge has faced critics (it creates an infection risk, it doesn't impact on patient safety etc). 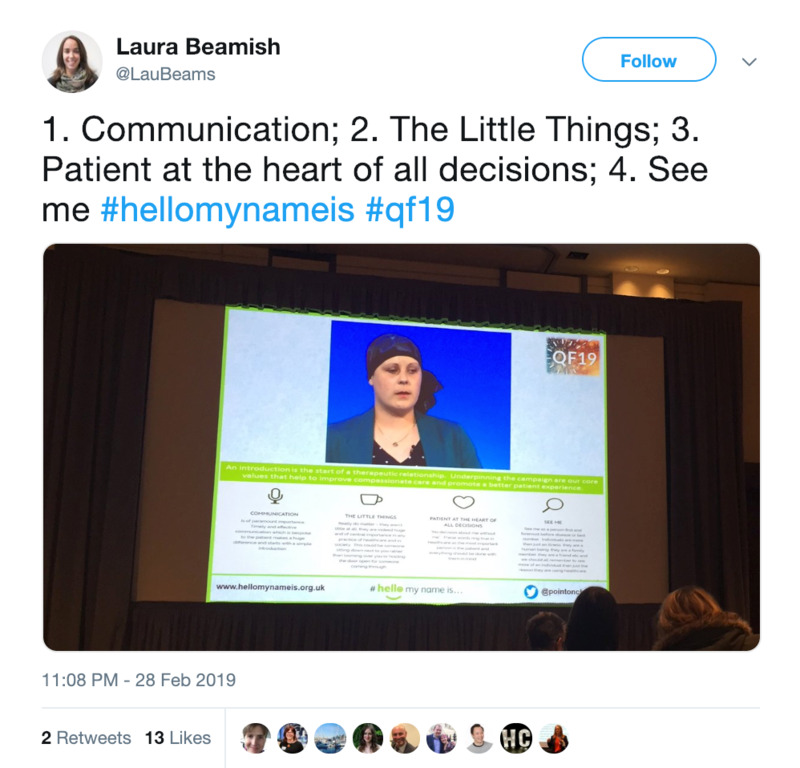 Here is a comprehensive list of reasons as to why wearing your name and role on your cap benefits communication, teamwork and patient outcomes. 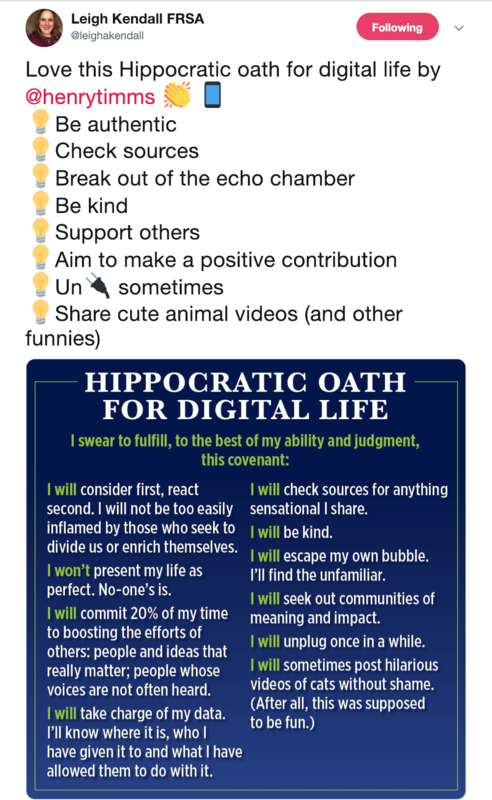 A reminder to keep the patient at the heart of care. "Language and communication are as vital as food and water. 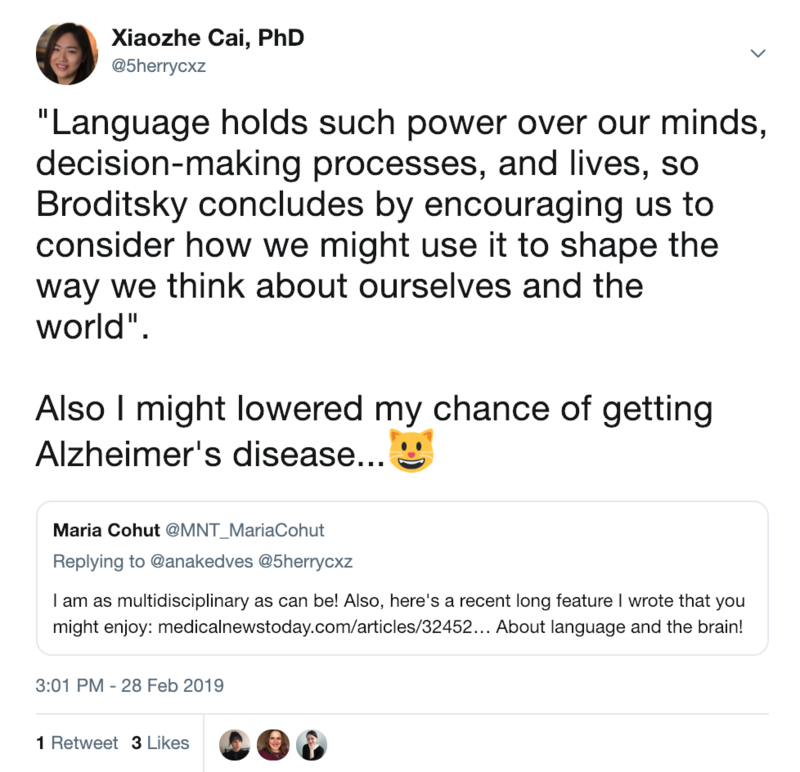 We communicate to exchange information, build relationships, and create art..." Read this article to learn 5 key facts about language and brain. Transactions vs. interactions: Transactions are scalable & repeatable. You can Six Sigma or Kaizen them. 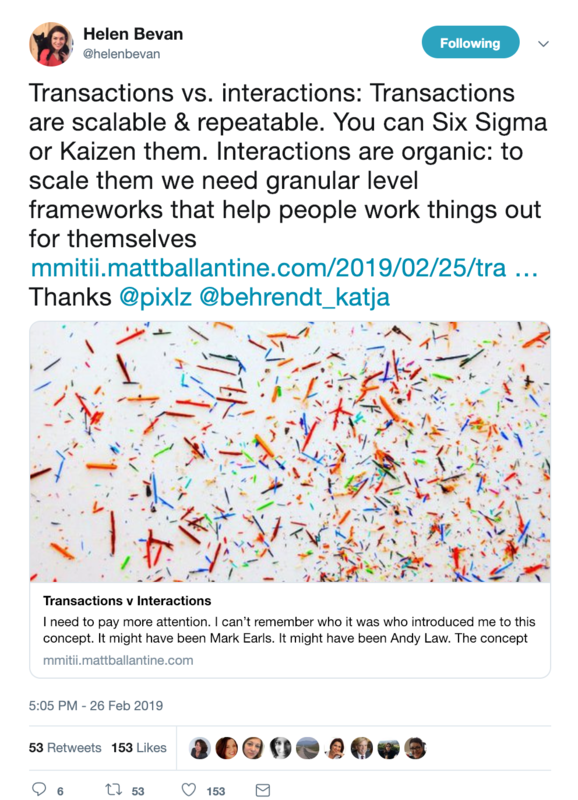 Interactions are organic: to scale them we need granular level frameworks that help people work things out for themselves. 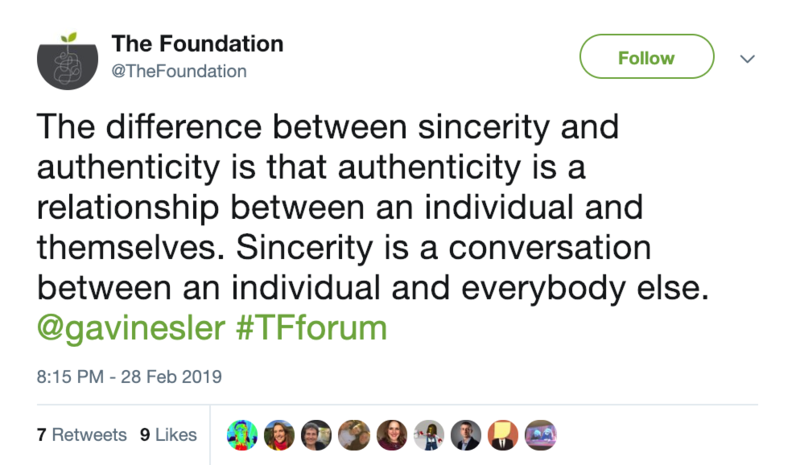 The difference between sincerity and authenticity is that authenticity is a relationship between an individual and themselves. Sincerity is a conversation between an individual and everybody else. 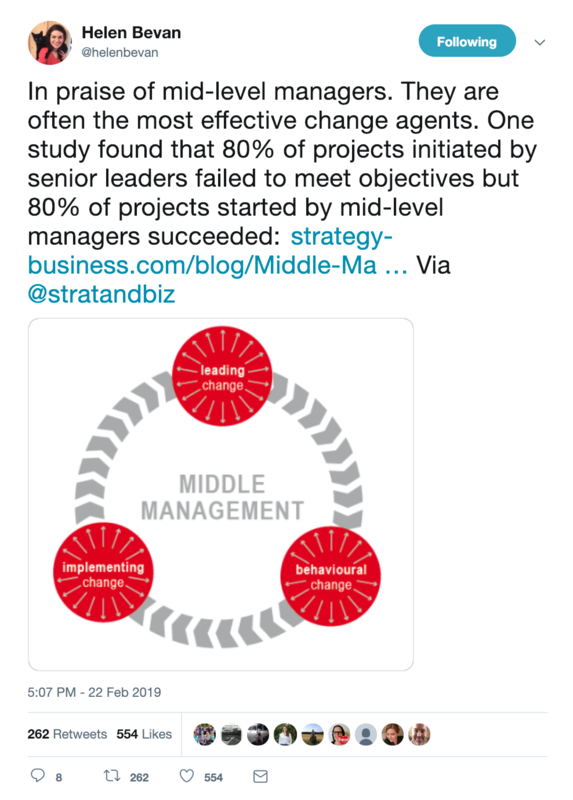 Mid-level managers are often the most effective change agents, and they deserve more respect. 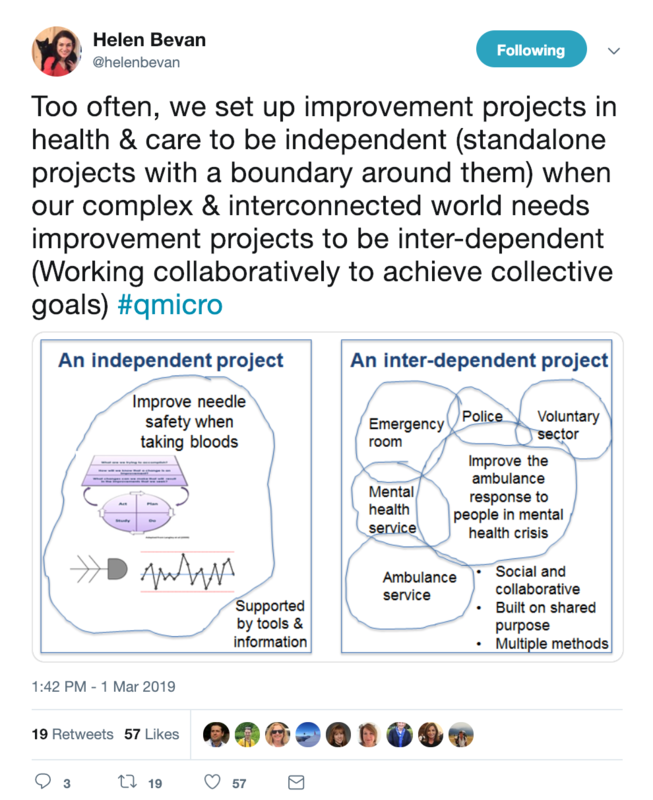 Too often, we set up improvement projects in health and care to be independent (standalone projects with a boundary around them) when our complex and interconnected world needs improvement projects to be inter-dependent (Working collaboratively to achieve collective goals). 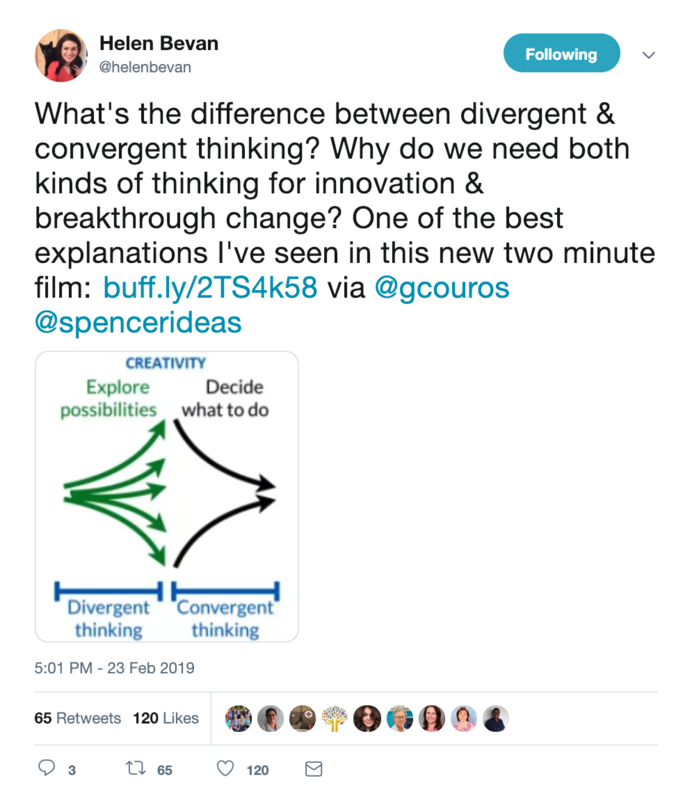 What's the difference between divergent and convergent thinking? 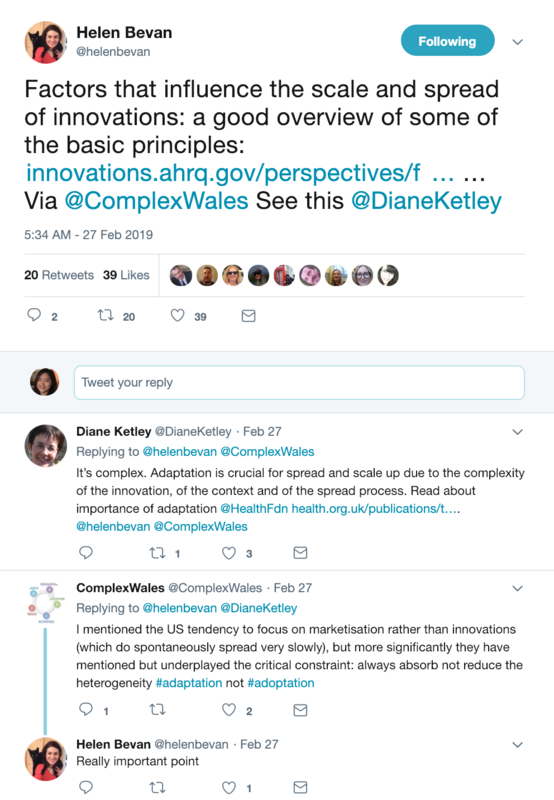 Why do we need both kinds of thinking for innovation and breakthrough change? See this two-minute film for answers. Factors that influence the scale and spread of innovations: a good overview of some of the basic principles. 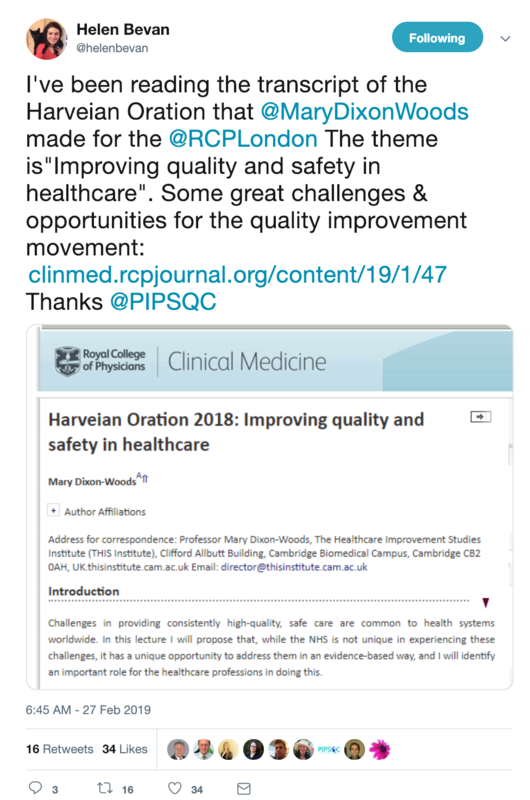 Some great challenges and opportunities for the quality improvement movement are discussed in this article: Harveian Oration 2018: Improving quality and safety in healthcare. 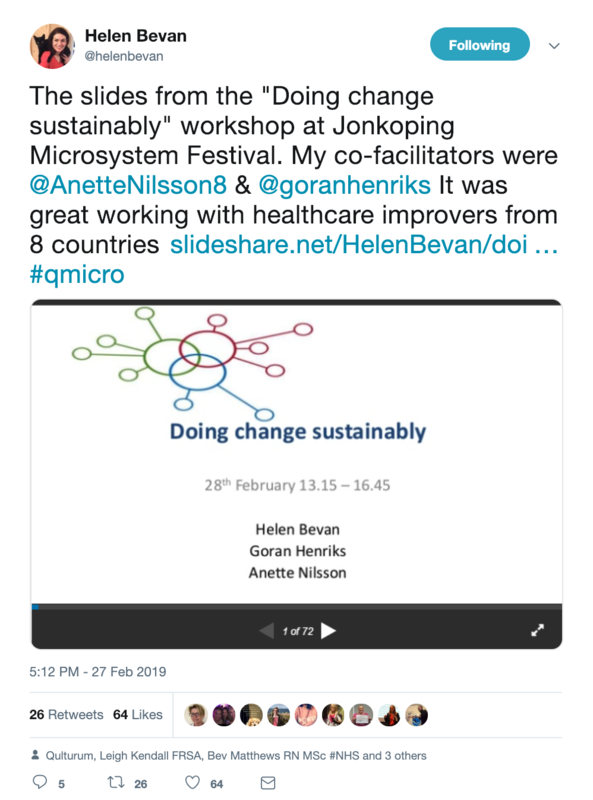 Helen and her co-facilitators's slides on Doing change sustainably, from their workshop at Jonkoping Microsystem Festival. The theme for the Jonkoping Microsystem Festival is sustainability. 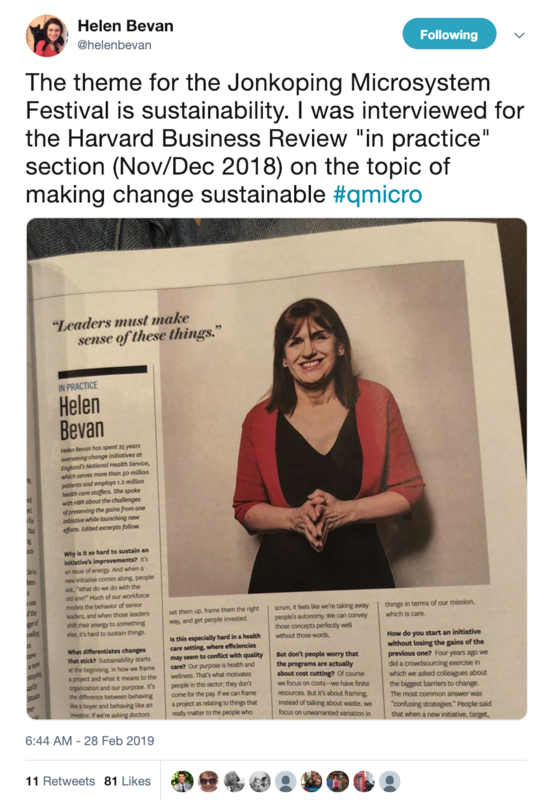 Helen was interviewed for the Harvard Business Review "in practice" section (Nov/Dec 2018) on the topic of making change sustainable. 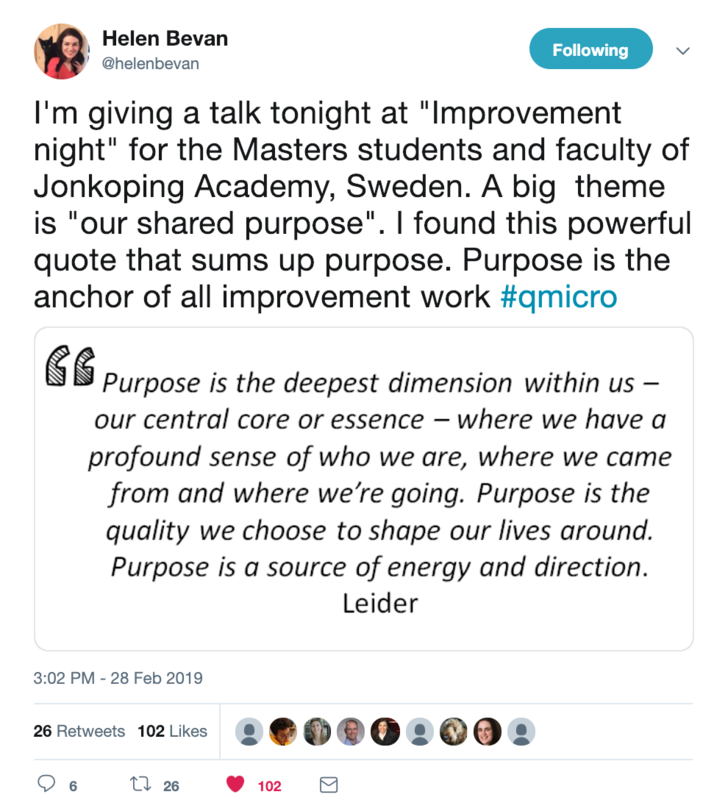 Helen also gave a talk at "Improvement night" for the Masters students and faculty of Jonkoping Academy, Sweden. 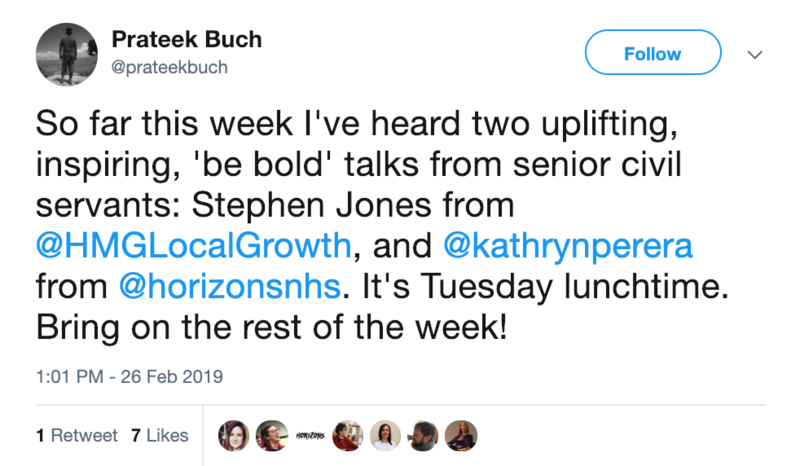 A big theme is "our shared purpose". She found this powerful quote that sums up purpose. Purpose is the anchor of all improvement work. 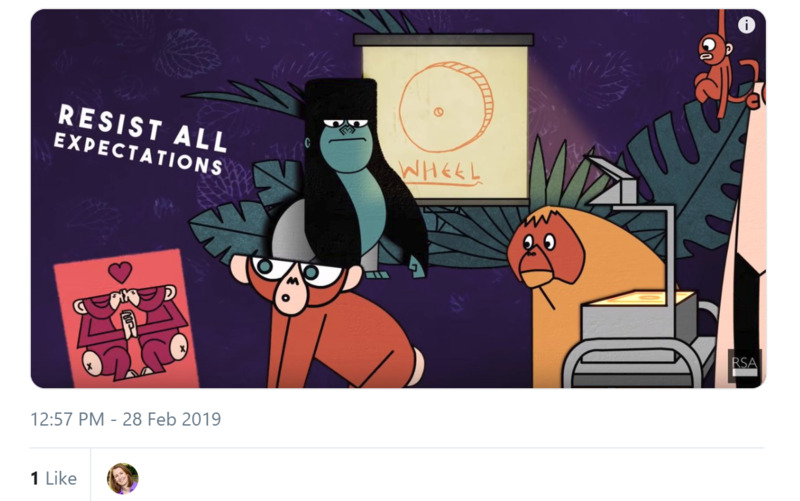 A brilliant animation about Gretchen Rubin's four tendencies, why they're important for influencing change, and meeting others' expectations. 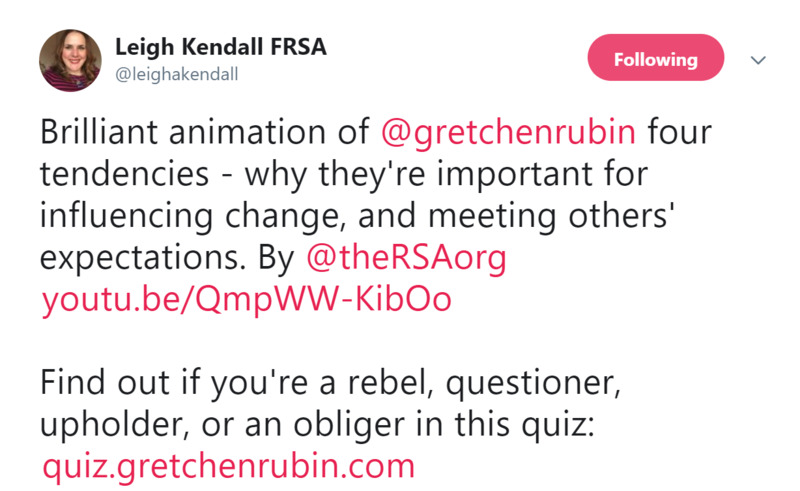 Find out if you're a rebel, questioner, upholder, or an obliger in this quiz. 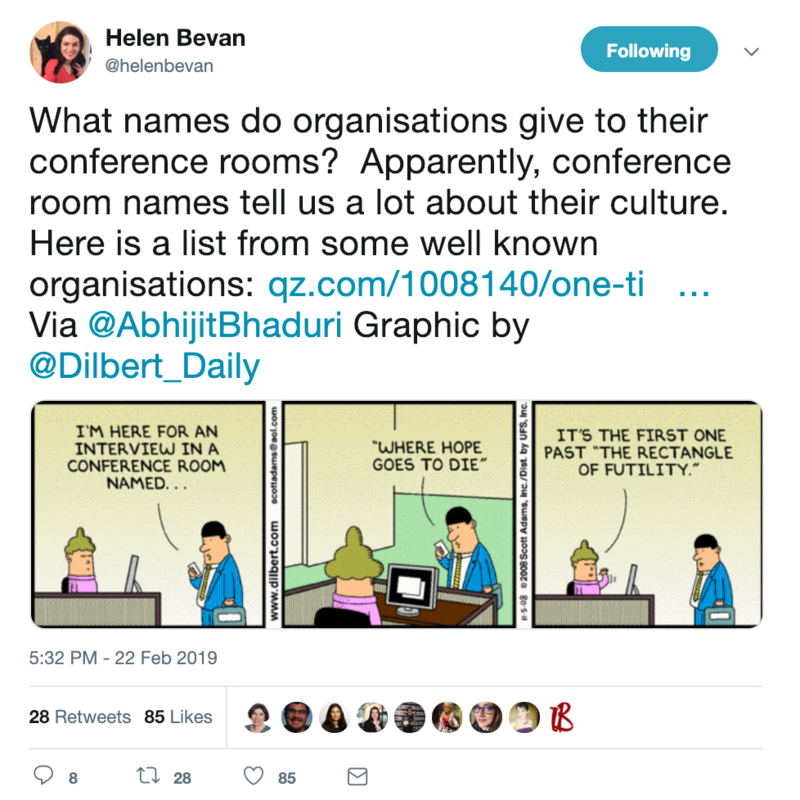 What names do organisations give to their conference rooms? Apparently, conference room names tell us a lot about their culture. 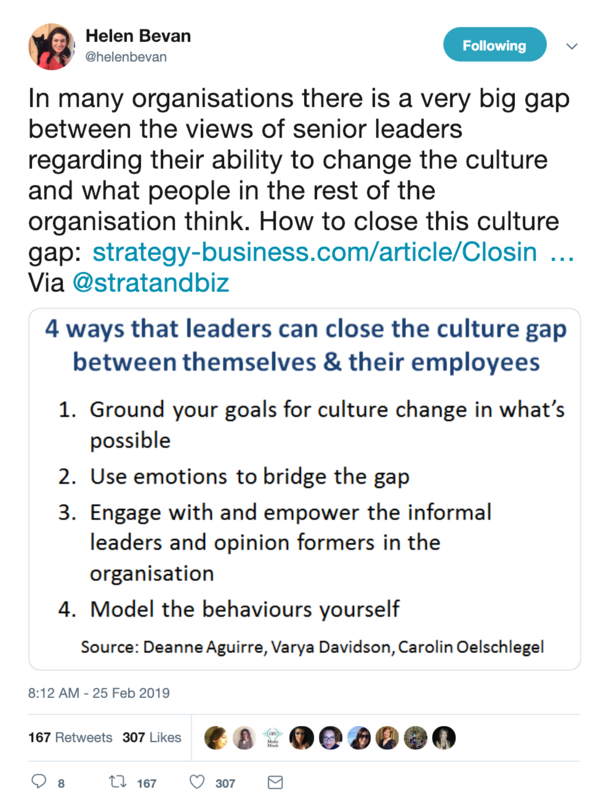 Here is a list from some well known organisations. So, what names do your conference rooms have?